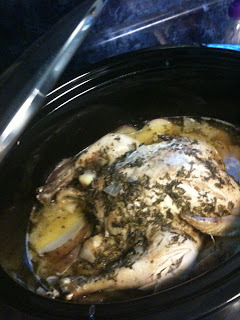 Head Over Heels: Lemon Herb Roasted Chicken..
YUM! My house smells like heaven and I have made a delicious slow cooked chicken, with potatoes and steamed veggies. 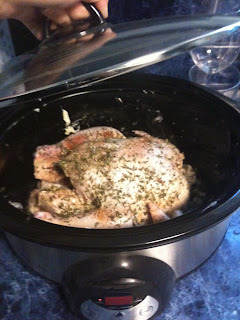 This is the very first time I have used my crock pot, so I wanted to share the experience with everyone. 1 regular sized crock pot. important b/c your chicken must fit. 2 medium sized red potatoes- chopped into fourths- I added this because I love red potatoes! 5. cook on the high setting for 4-5 hours. ** if you want to add the potatoes, put them in about 40 mins before the chicken should be done. Tip: check your chicken about once an hour to make sure it isn't over cooking, smaller ones will cook faster. My chicken was done in four hours because it was a smaller 4lb. I took some before and after shots of the slow cooked chicken and potatoes. You can't tell but the chicken was so tender that it fell off the bone! I used a wooden ladle to scoop, and the chicken would just fall apart. Slow cooking deliciousness!! I also made cornbread muffins, still working on that recipe...they were kind of hard. Well happy crock pottin' and let me know if you have ideas for other slow cooked foods. mmmmm sounds delish! I'm gonna make this!